Get customized IT Executives Email List, IT Decision Makers Mailing List, and IT Telemarketing list to reach your targeted IT Companies and decision makers in the USA, Canada, UK, Australia, Middle East, South Africa and Asia. Organizations these days are spending a major chunk of their budgets on adopting newer IT systems and keeping the existing systems updated. The demand for solutions such as ERP, CRM, SCM and many others are high on demand. So is the demand for IT services such as implementation, customization, and up-gradation. Keeping up with the burgeoning market for IT products, solutions, and services, marketers need reliable data to successfully implement their multi-channel marketing strategies and get themselves heard in the heavily crowded market. Blue Mail Media comes as an ideal choice to fulfill all your database needs. We offer one of the most authentic, verified, and result-oriented IT Decision-Makers Email Database that is sure to positively influence your ROI. Blue Mail Media houses a skilled team of experts, analysts and Data scientists who meticulously work towards collecting data from reliable sources and maintaining the accuracy of IT Decision Makers Users Mailing List. Also, our strong data partners network spread across USA, UK, Canada, Europe, Asia, North America, Australia, and other countries enables us to serve you beyond geographic constraints. Blue Mail Media tracks developments in the IT industry very closely and has been building a database of IT professionals and decision makers from developed as well as emerging global markets. 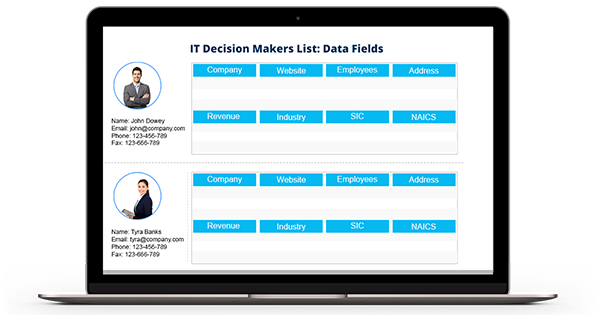 Our IT Decision Makers Users Email List provide marketers with complete information to reach their prospects via telephone, email or mail. Furthermore, our Decision Makers Email Lists is updated on a timely basis and its accuracy and reliability are maintained by making thousands of verification calls and sending emails every day. With Blue Mail Media, you can either opt for a pre-packaged IT Executives Email List or you can request a customized list of IT Decision Makers based on your specific preferences.